Restore's Mr Jonathon Pleat addresses the meeting. We thank Mr Nigel Mercer (President of BAPRAS) for this photograph. 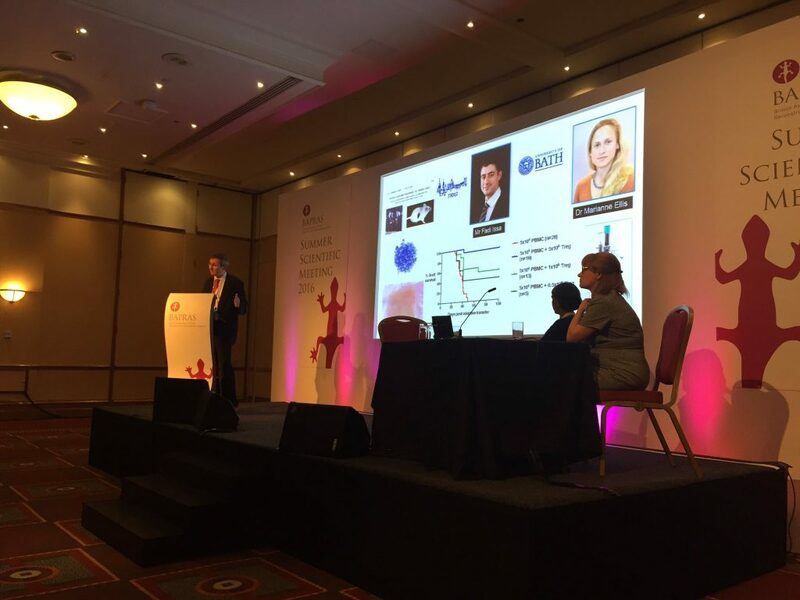 BAPRAS (The British Association of Plastic, Reconstructive and Aesthetic Surgeons) recently held its Summer Scientific Meeting in Bristol. Restore was in attendance, with Mr Jonathon Pleat (Director of Research) delivering a talk on the history of Restore and Dr Ningwen Zhu, who has collaborated with Restore, speaking of his clinical work in Shanghai. Mr Pleat discussed the team that Restore has assembled and outlined how Restore is both proud of its rich history of scientific achievements and contributions by eminent past fellows, yet very much focussed on the most current challenges of burns and scar research. Current topics discussed included determining the depth of skin injury which triggers scarring, and work aimed at shedding more light on the cellular and molecular mechanisms involved in this process. Dr Ningwen Zhu, a professor of burns and plastic surgery and a previous BAPRAS visiting fellow recounted illustrative cases of the large numbers of major burns in China and the extraordinary surgery undertaken to improve the lives of these patients. One of Dr Zhu’s colleagues and research fellows Dr Jianlan Liu, Consultant dermatologist, will soon be working with Restore to further her research into novel means of resurfacing burns.